Stanhope – the green and tranquil market town at the heart of the Durham Dales and hub for outdoor activities. Pronounced ‘Stan-up’, Stanhope is a small market town in County Durham in northern England, situated on the river Wear between Eastgate amd Frosterley on the north side of Weardale, where the A689 Trans-Pennine road meets the B6278 from Shotely Bridge to Barnard Castle. The parish of Stanhope is the most extensive in the county of Durham, formerly comprising an area of 54,780 acres, bounded on the north by the parishes of Muggleswick and Hunstanworth and on the south and south-west by Middleton-in-Teesdale. Many of the current parishes were former chapelries. The original Stanhope parish consisted of Eastgate, Heathery Cleugh, Rookhope, St Johns Weardale and Westgate The church, dedicated to St Thomas the Apostle, stands on the elevated ground on the northern side of the town. It is an ancient structure, pricially of the Norman period and simple in detail. Its Oldest portion is the lower stage of the tower, later restorations and additions are of early English and later decorated styles. The chantry chapel is dedicated to St Mary and was probably added around 1225. In the local churchyard stands the stump of a petrified tree. This was discovered as a pair, the other being housed in the Hancock Museum in Newcastle-upon-Tyne. A ford with stepping stones for pedestrians is also nearby as is the Durham Dales Centre which includes a tea room, craft shops and tourist information. 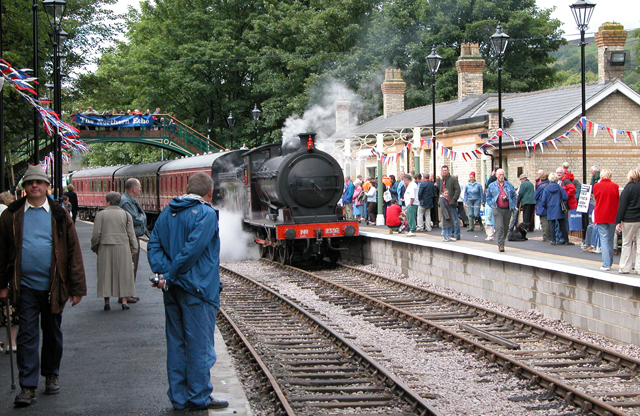 Heritage trains run on a regular basis to Frosterley and Wolsingham and also acts as the terminus for the Weardale Railway. The town is a picturesque haven for visitors seeking rest and relaxation amidst beautiful surroundings.